Learning how to hang drapes takes a little more skill than hanging curtains. Today many people use the terms drapes and curtains interchangeably, but it doesn't hurt to understand the difference when it comes time to buy your window treatments. 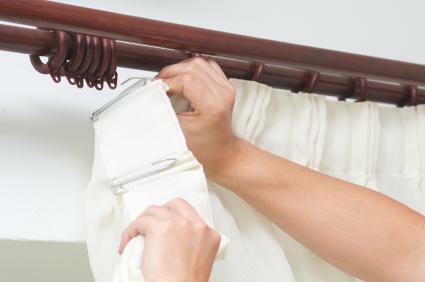 Drapes are considered more formal than curtains and usually hang to the floor. The are pleated at the top and are made of rich fabrics which are often ornate. While both curtains and drapes add a decorative touch to any room, drapes are also used to provide a measure of privacy by helping to block out sound, and with the right fabric choice are used to manipulate the effect of direct sunlight in the room. Silk - Silk is a popular drapery fabric but should not be used in windows exposed to full sunlight. Brocade - Works great for drapes used to keep the light out but this heavy fabric is not suitable for rooms that need a light, airy touch. Rod should be centered on the window - To accomplish this, measure the window width from frame to frame. Subtract this measurement from the total rod measurement and divide the answer by two. The result is the amount in inches that your brackets will be installed to the left and right of the window frame. Top of rod should be same height from the floor as the finished drape length. Leave one carrier unused at the end of the rod in case an extra is needed later. Take your time to hang drapes properly as it makes a big difference in overall presentation.